Stockholm: US economist Paul Krugman, a prolific columnist for The New York Times and a fierce critic of Washington’s economic policies, won the Nobel Prize for economics on Monday. The Princeton University professor was rewarded for his “analysis of trade patterns", the Nobel jury said. Krugman, 55, has formulated a new theory that determines the effects of free trade and globalization, as well as the driving forces behind worldwide urbanization, the citation said. “Krugman’s approach is based on the premise that many goods and services can be produced more cheaply in long series, a concept generally known as economies of scale," the jury wrote. Unlike traditional trade theory, which assumes that differences between countries explains why some nations export agricultural products while others export industrial goods, Krugman’s “theory clarifies why worldwide trade is in fact dominated by countries which not only have similar conditions, but also trade in similar products", it added. Krugman has formalized a new global trade policy which helps to explain that globalization tends towards concentration, both in terms of what a manufacturing base makes, and where it is located. His theory shows that globalization tends to increase the pressures on urban living, sucking people into these centres of concentration. “Krugman’s theories have shown that the outcome of these processes can well be that regions become divided into a high-technology urbanized core and a less developed ‘periphery’," the jury said. The issue of ever greater concentration in cities is a major issue everywhere but particularly in developing countries, since the cities struggle to have the infrastructure to cope, and urbanization makes it increasingly difficult to deal with urban environmental pollution. Last year, US trio Leonid Hurwicz, Eric Maskin and Roger Myerson won the prize for their work on trading mechanisms aimed at making markets work more efficiently. Last week, former Finnish president and famed peace negotiator Martti Ahtisaari won the Nobel Peace Prize, while French author Jean-Marie Gustave Le Clezio clinched the literature prize. French and German scientists credited with the discovery of the viruses behind AIDS and cervical cancer won the medicine prize. The physics award went to Makoto Kobayashi and Toshihide Maskawa of Japan and Yoichiro Nambu of the US for work in fundamental particles. Osamu Shimomura of Japan and US duo Martin Chalfie and Roger Tsien won the chemistry prize for a fluorescent jellyfish protein that has become a vital lab tool. Laureates receive a gold medal, a diploma and 10 million Swedish kronor ($1.42 million), which can be split between up to three winners per prize. ?The formal ceremonies will be held in Stockholm and Oslo on 10 December. Stockholm: The US economist who won the 2008 Nobel Prize for economics said on Monday the world economy could suffer a prolonged recession but might escape collapse. “This is terrifying," Paul Krugman, speaking after learning of his award, said of market chaos over recent weeks. But he added: “I’m slightly less terrified today than I was on Friday." Policymakers around the world agreed drastic steps over the weekend to rescue banks and free up the flow of lending in the hope of staving off a global recession. 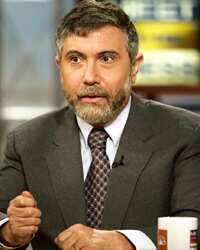 Krugman, a strong critic of the Bush administration, praised the efforts made by world leaders to staunch the crisis. “We’re going to have a recession and perhaps a prolonged one but perhaps not a collapse," he said. The Nobel committee awarded Krugman the prize for work that helps explain why some countries dominate international trade. He has long featured among the favourites to win a Nobel. The Royal Swedish Academy of Sciences said the prestigious 10 million kronor ($1.42 million) award recognized Krugman’s formulation of a new theory that addresses what drives worldwide urbanization.